The first-principle approach is designed for the interpretation of the experimental observations and prediction of properties for new nanomaterials. The understanding of physical phenomena requires a description at the atomic scale where size and geometric organization play important roles. The major challenge is to model systems as close as possible to those developed in the laboratory. The complexity both in terms of the geometric structure and chemical composition that comprise the modeling of such systems requires an entire panel of approaches ranging from semi-empirical methods to ab initio methods. At the atomic scale, the elementary bricks of the buildings are atoms. The cohesion and dynamics of these buildings are the result of interactions between these atoms. Two major classes of modeling techniques for these buildings can be distinguished: Electronic structure calculations and molecular simulation methods. Molecular simulation methods are limited in their application since they cannot be used to model properties that depend on the electronic structure. As part of the electronic structure calculations, the building is described by the notion of wave function. One of the fundamental tasks of quantum physics is to solve a differential equation according to the electronic, nuclear and spin coordinates via the Schrödinger equation. The resolution of this equation in analytical form is impossible, except in the case of hydrogenites. Different numerical resolution methods have been developed based on a series of simplifications and successive approximation techniques. Once solved, this equation gives the total energy of the system, the associated wave function, and the energies of the electronic states. These methods are applied at a temperature of zero and at a fixed pressure. There are several families of methods: Semi-empirical methods, Hartree-Fock (HF) methods and density functional (DFT) methods. From the dependence of the total energy on the volume of the mesh, we can deduce the equilibrium crystalline parameters, the modulus of rigidity or the enthalpy of formation. Finally and above all, they allow, through studies of electronic structure, to identify the phenomena that govern the substitutions. In other words, thanks to the fundamental laws of quantum physics, it is possible to compute macroscopic properties from microscopic information. The interface between the first-principle and experimental design could provide a way to answer a lot of problems and open questions on the physical properties of nanomaterials. The purpose of this book is to propose some ideas to answer the most important question in the design of nanomaterials (OD,1D and 2D) for nanotechnology application, namely, nanomaterials for spintronic application, nanomaterials for solar energy technologies application, magnetic refrigeration applications, switchable materials application and nanomedicine applications. 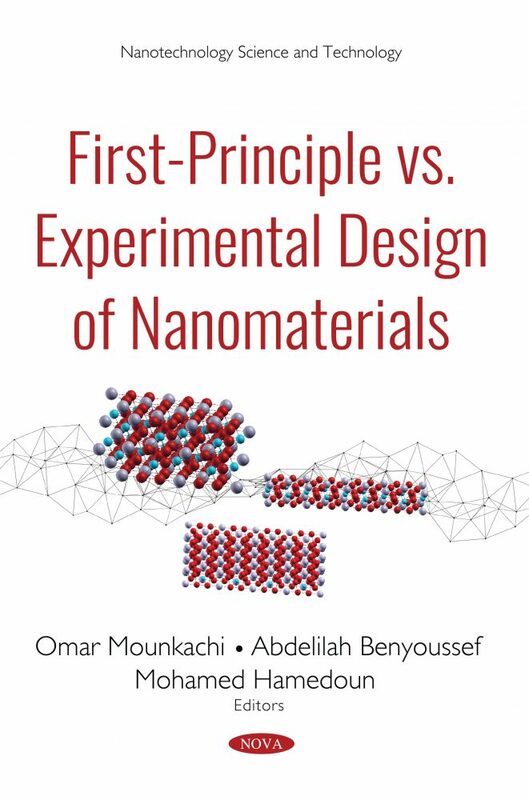 Additionally, the author will discuss the correlation between the first-principle and experimental design to see how the properties of the yet-to-be-synthesized nanomaterials can be predicted. Based on experimental and on first-principle calculations design, the author will discuss structural, optical and magnetic properties of new nanomaterials. New physical properties will be discussed in nanomaterials recently observed, and this creates new opportunities for development and construction of a new nanomaterial for nanotechnology applications.